shown crouching with head held low and resting on its forepaws, compactly modelled and smoothly contoured in a simplified realistic style, the long ears laid back and the large eyes daubed in iron-brown under a clear glaze, showing a pale bluish tint where the glaze pools on the flat rectangular base with chamfered corners, the underside left unglazed revealing the dense white porcelain. A white porcelain rabbit sculpted in a very similar style but shown seated on its haunches with head up, from the Eumorfopoulos Collection, which was shown in the International Exhibition of Chinese Art at the Royal Academy in London, 1935-36, illustrated in the Catalogue, no. 989, and now in the British Museum, is illustrated by Jessica Rawson in Chinese Jade from the Neolithic to the Qing, London, 1995, p. 365, fig.3. 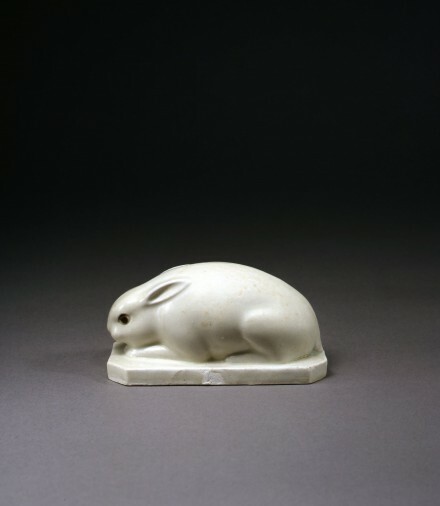 Compare also the small Tang dynasty stone carving of a crouching rabbit shown in this same recumbent pose on top of a rectangular base in the British Museum, illustrated by Rawson, op.cit., p. 365, fig.2, and a white marble weight surmounted by a crouching rabbit to serve as the handle, excavated in Shaanxi from a Tang tomb, also illustrated by Rawson on the same page, op.cit. fig. 1.